My name is Neha I would like to say my experience with Dr. Gandhi was amazing. She was on top of everything she gave me great advise I got pregnant within few months of my treatment. Her staff was also very nice and organized. They would always call me in on time and where very helpful. I would definitely recommend her to other people. My wife and I struggled to have our first child for more than two years. In this time we determined that we each had physical factors contributing to the difficulty, and there was nothing we could do to change these factors. There are really no words to describe the emotion we felt when receiving this news. As I write this, I tear up because it was devastating. The thought of not being able to have children made us angry, sad, it caused us to fight, it was super stressful, and it negatively impacted just about everything. If you are reading this, you likely know exactly what I mean. Then we met Dr.Gandhi, and her very sincere team..... and our world changed forever. We felt HOPE. We felt like someone CARED. We didn't feel alone any more and likely most important, we felt comfortable. I remember leaving Dr. Gandhi's office that first day feeling POSITIVE for the first time in a very long time, and it never went away. 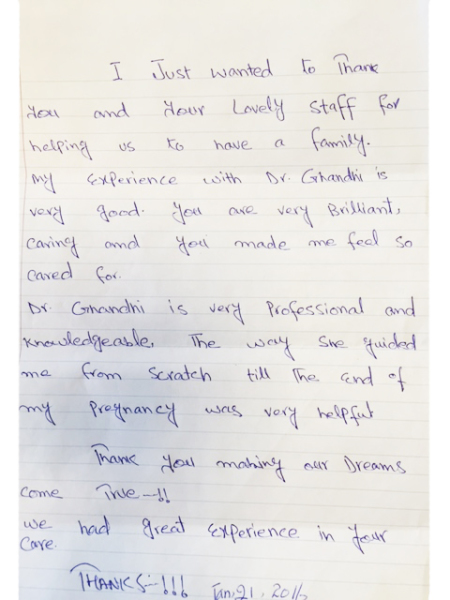 What can I say about Dr.Gandhi, and her team --- well.... they are filled with compassion, understanding and encouragement, they are loving mothers, grandmothers and wives, and they are experienced, knowledgeable and successful. It is the positive interpersonal connection that we were able to immediately make with Dr.Gandhi and her team that truly made all the difference in the journey ahead at that time. I am blessed to say that, with the support of Dr.Gandhi and her team, my wife and I are now the proud parents of two beautiful children! Jack, our first born, was conceived using IVF and Adriana was naturally conceived only 13 months later (it is amazing what a reduction in stress levels can do)!! I will never forget the day Dr.Gandhi came into the waiting room to let us know we were pregnant as she gave me a great big hug in front of everyone (and even before my wife, haha). She was beside us every step of the way, and we truly consider the entire team at the clinic to be an extension of our family and support circle. Embarking on the journey of seeking help when conceiving a child can be one filled with anxiety and that 'why me' negative emotion. But the moment we met Dr.Gandhi and the team we not only knew that we were in the right hands, we knew that it would be an experience that was filled with compassion, understanding and encouragement, no matter what the outcome. Words cannot begin to thank you enough for all that you did for us. You made us feel comfortable during a time that was pretty scary for us. 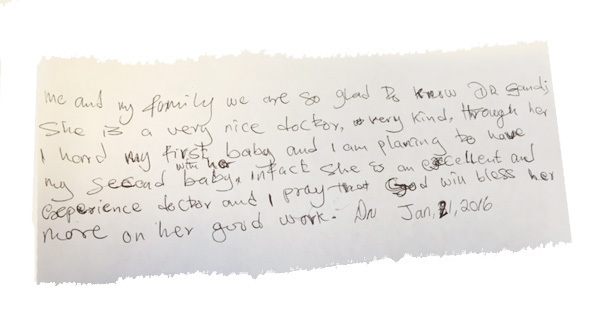 You are a great doctor and we are so glad that you were the one to help us achieve our goal of adding to our family. Moreover You and your staff is amazing and went beyond our expectations in every way and made us feel taken care of and in good hands. A truly top notch team under your supervision. I thought that I had it all...a wonderful husband, a beautiful home, and an amazing career. I loved my life...but something was always missing. So we decided to have a baby. I thought it would be as easy as everything else in my life had been. We tried, and tried and tried. Nothing happened, except that I was getting more and more depressed. After consulting my family physician, she decided to connect me with Dr. Gandhi. Needless to say I was skeptical about the whole concept of a fertility clinic. I surely did not want to conceive 6 children at one time!! But since the traditional method was not working out for me, we took the plunge. My husband and I went to the clinic together in January of 2008 and had our initial consultation with Dr. Gandhi. We were immediately made to feel comfortable, and the once faded sparkle of hope, now began to shine again. I was inspired just by looking at the hundreds of pictures of babies in frames lining the corridors. The smiles on the parents' faces told me that it would be worth it all. The process took a lot of courage and determination, but after a few bumps (I had to stop for a month because of a minor day surgery) I finally conceived. Everyone was thrilled for me. I felt as if I was the first and only woman to conceive, because of the unique, special treatment that I received. The care during my pregnancy was excellent. I did not feel abandoned at all. When it was time to be transferred to a Obgyn, I was recommended to an very experienced physician nearby. One year after the process began, in January of 2009, I gave birth to a 10 pound, 21 inch long beautiful baby girl, whom we named Rachel (Lamb of God). Dr. Gandhi even took time out of her very demanding schedule to visit us in the hospital!! Without a doubt, our Rachel would not have been in our lives, had it not been for the amazing dedication, expertise and care that was provided by Dr. Shruti Gandhi and her wonderful staff. There is no greater joy than having been blessed with a child. Thanks a million for the wonderful treatment and care provided during the last 9 months. For all the friendly and professional people at this clinic, we want to wish them happiness and prosperity. Our precious child was born on December 05, 2009. Me and my wife were happy married couple for last 5 yrs. We started our relationship with fresh love, zeal & enthusiasm. We were doing great every thing looked like going smooth. As the time went by, we were becoming anxious to have a baby to strengthen our relationship. Though we were positive & optimistic about having a baby it took a while. Then we started looking the things from the differentprospective.So we consulted our family doctor & we were referred to Dr. Gandhi clinic. We went through all necessary process to get a baby. To me it looks a long process, but we have to start some where, we have to take initiative, even the God cannot make you successful if you don't try or put your efforts. So Dr. Gandhi was the means & probably the right choice. Dr. Gandhi's professional experience & approach towards a patient is appreciable that makes us feel confident, warm & cozy in her presence. Even though we know very well that its a time consuming process & sometimes ending up with no results. 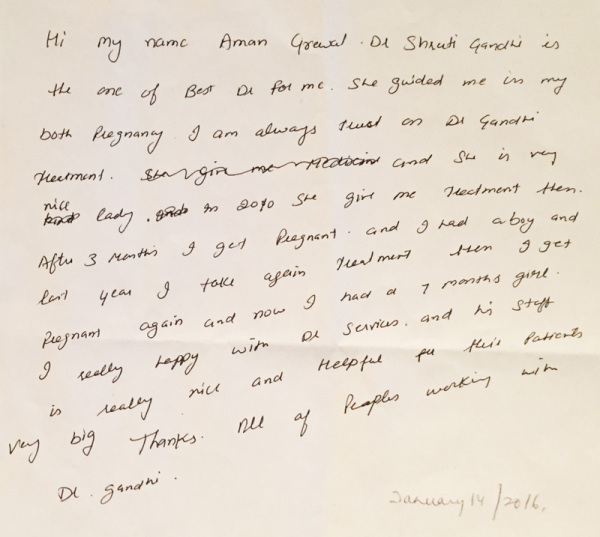 Once again I would like to thank Dr. Gandhi & her entire staff for their support & services. I recommend her without any reservation to any couple who are are willing to have a baby but having difficulty in having one. to you for always been there whenever needed you . 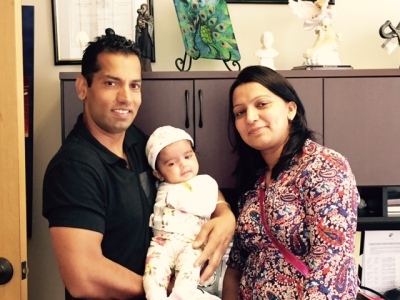 We have been coming to see Dr. Gandhi since 2003 and found her very good, caring and helpful. We always feel comfortable talking to her regarding any issues. In 2007, we had our first daughter and now we are expecting talking baby. We encourage people to visit Dr. Gandhi without any hesitation. 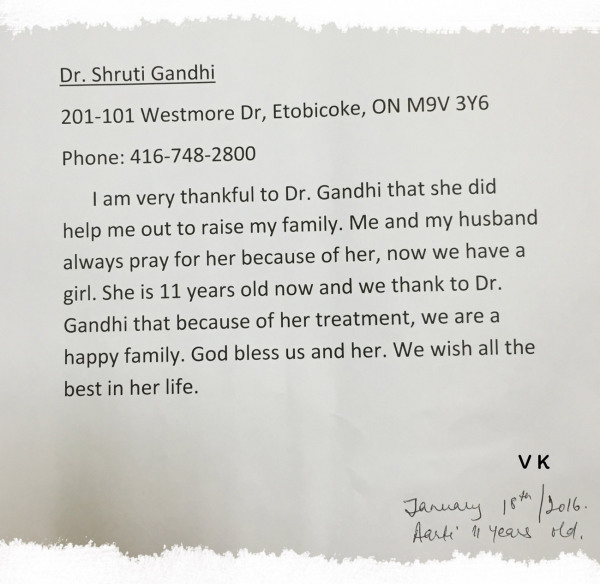 Before coming to Dr. Gandhi's clinic, we visited many doctors in Toronto, but never get such a good response and care. I can't say enough good about Dr. Gandhi and her staff. Everyone was so helpful and informative. Every time I have visited Dr. Gandhi they put me at ease and answered all my questions. It is because of Dr. Gandhi's experience and with her right direction, today I am blessed with two beautiful baby boys. Thank you Dr Gandhi for everything!! Words are not enough to express ourjoy and satisfaction to you and all the staff who work with you, who helped us to bring our little baby into this world. It is rare today to meet a medical professional like yourself, someone who gets to know the patients in their care who takes the time to consider the patient's feelings. You have exhibited a special act of caring that is a comfort to couples in our position. The treatment, service, advise, kindness, privacy and optimism we received from you and your staff was truly encouraging and supportive. If only all doctors could be like you, it could be a better world. Sometimes God answer our prayer thru special people like you. I would like to thank you for your care and compassion during the process of my treatment at your clinic. Thanks the way you and your staff give strength to your patients. Thank ou for helping us bringing our baby into this world! This would not have been possible without your support and inspiration! May God bless you always. Thank you very much for all that you have done and always being there and supporting us. You always gives strength and courage. We appreciate everything you have done for us. Thank you very much for bringing and making our dreams come true. Our baby was born on Feb. 2007, weighs 7 lb. 10 oz. He brings lots of joy to our family. A big thanks to you and your staff! God has gifted us a little baby boy born on July 2007. Thanks for helping us in a critical time. May God give you more strength and courage to help more people and be successful in that! Thank you so much for making us believe and giving us hope, and most of all giving us gift of life. Thank you Dr. Gandhi. brings us so much happiness. There is no word to describe how grateful we are to you. Thank you and God bless you. Thank you so very much for all that you have done for my husband and I. 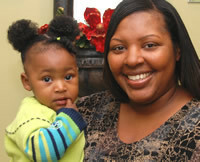 Without your wonderful and dedicated professional assistance, we would not have such beautiful babies. It was a long 2 years and you always seemed to convince us to keep going, just when we felt like giving up. We will someday tell the babies all about you and hopefully meet you when they are grown. One year has past since the birth of our son. We have enclosed a photo of him, which was taken on his birthday. We would like to thank you for all that you have done to help us. This past year has been the best year of our lives. Our son is very happy and pleasant boy. He is very curious and playful. Truly, he is a blessing and a miracle. May God bless you, your family and your practice. Just a short note to say hello!. Hope you and your family are doing well. My son and I spent February 1999 in Florida with my family. My son loved the sun and the beach.. Our son is now 6 months old, absolutely wonderful and what a joy! !